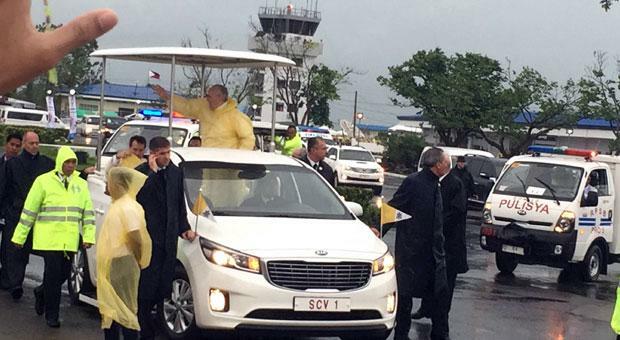 Pope Francis has arrived in typhoon-hit city of Tacloban in the Philippines to hold an open-air Mass. Tacloban was devastated by Typhoon Haiyan just over a year ago. Tens of thousands braved pouring rain and strong winds brought by Tropical Storm Mekkhala to attend the Mass. Pope Francis was due to meet survivors of the typhoon after the mass but the storm forced the pontiff to cut short his visit. The Pope said as soon as he saw the catastrophe caused by the typhoon, he had decided to go to the Philippines. Pope Francis is visiting the Philippines, where there are 80 million Catholics, as part of a six-day tour of Asia. Typhoon Haiyan, which remains the strongest storm ever recorded on land, created a 23ft high storm surge, destroying practically everything in its path when it swept ashore on November 8, 2013. Around 90% of the city of Tacloban in Leyte province was destroyed and more than 14.5 million people were affected in six regions and 44 provinces. About one million people remain homeless. Pope Francis was due to have lunch with survivors of Typhoon Haiyan later on Saturday but he left Tacloban four hours early because of the approaching storm and returned to Manila. The Pope said his pilots had told him that the weather was going to get worse. “We barely have time to get to the aeroplane,” he said. Tropical Storm Mekkhala, with winds of up to 80 mph, forced the suspension of ferry services to Leyte and stranded thousands of travelers, according to the Associated Press news agency. One woman was killed after the mass, when scaffolding near the stage collapsed, local media report. The storm is forecast to hit the shore of nearby Samar Island later on Saturday. During the Mass in Spanish, with a translation into English, Pope Francis spoke of the devastating impact of Typhoon Haiyan on people in Tacloban. He told the faithful that “so many of you in Tacloban have lost everything. I don’t know what to say – but the Lord does… He underwent so many of the trials that you do”. A national holiday has been declared in Manila for the duration of Pope Francis’ visit. Security is very tight, with tens of thousands of soldiers and police deployed, after failed attempts to kill two previous popes in the Philippines. The centerpiece of Pope Francis’ visit will be an open-air Mass in Manila on January 18, which is expected to attract millions.